Why is Bay-Friendly Landscaping Important? Over the last two decades, there has been a significant reduction in plant debris landfilled in the San Francisco Bay Area, due in large part to residential recycling programs and because tens of thousands of households practice backyard composting. This positive trend reflects the interest of residents in recycling plant debris and reducing waste. But more needs to be done, as tons of plant debris are still thrown away each year. Twenty-three states have banned or limited the disposal of plant debris in their landfills; however, California has not and statewide, 2.7 million tons of plant debris are landfilled each year. Leaves and clippings alone are sixth out of the ten most prevalent material types in California’s overall disposal waste system. In Alameda County alone 110,000 tons of plant debris are still landﬁlled each year, much of which passes through the hands of a professional landscaper. Other types of waste, including plastics and hazardous wastes, are also generated by conventional landscaping practices. The horticultural industry in the US throws away almost a half- billion pounds of greenhouse ﬁlm, plastic pots and plastic ground cover each year. Annual disposal of leftover pesticides used by residents costs tens of thousands of dollars for each Bay Area County — and only a fraction of the pesticides are disposed of properly. 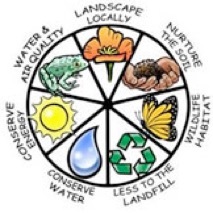 Bay-Friendly landscaping minimizes the use of plastics and pesticides, and diverts plant debris from the landﬁll by preventing waste in the first place through careful plant selection, watering and fertilizing or reusing plant material through grasscycling, mulch and compost. Because generating plant debris is linked to a wide range of landscaping practices — such as watering and fertilizing — this integrated solution is essential. Bay-Friendly Landscaping is. . .
A whole systems approach to the design, construction and maintenance of the landscape in order to support the integrity of one of California’s most magnificent ecosystems, the San Francisco Bay watershed.